Whatever the teachings of Ashura, it has been wasted on us. A gang of certified despots rule Iran. We have no courage to stand up to male-chauvinism. 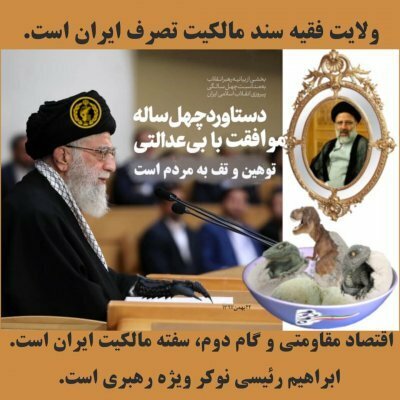 The ayatollahs chose the fourth of November 2014 as the day to show their might to the world. A prelude to the 24th of November Nuclear negotiations with the West in Vienna . Thirty-five years ago to the day, the US Embassy in Iran was stormed and hostages were taken for 444 days. In the eyes of the mullahs this act of sheer violence has become a symbol of Iranian strength. The day is marked in the secular solar calendar for propagandist revels. Some 1335 years ago, the third Shiite Imam, Hussein, with a handful of his followers, battled against the Caliphate, and lost. In the sixteenth century the Shi’ism was declared the official religion of Iran, and the martyrdom of Hussein became an important date in the religious lunar calendar. Lunar dates move with the seasons, and once in while coincide with a celebration of the solar calendar. 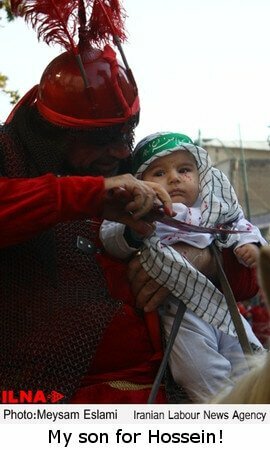 In 2014, the teachings of Ashura , the mourning of Hussein, coincided with the celebrations of the US Embassy’s hostage taking. The gang of clergy had to make the most of both events based on violence. The teachings of Ashura: Stagnation and solitude despite the propaganda. 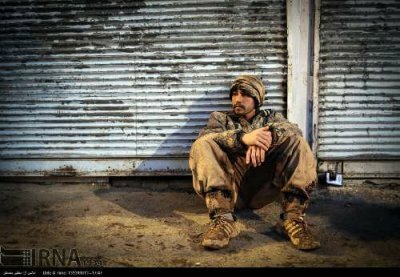 The Iranian theocratic regime is going through rough times. It is an ageing system animated by the illusion of the “Glorious Islamic Revolution”. The contrived election of Hassan Rouhani to the presidency is boomeranging, sooner that it was thought possible. The Iranian nefarious politics in the Middle East is also boomeranging. The Daesh, a monster that Iranian deeds and shoddy Western politics in the area helped to nurture, has shadowed the nuclear deals with the West in the news much to the dismay of the conceited ayatollahs and their cronies, who are too eager to be under the international media spotlights. The inflation rate is spiralling and the pollution kills more people than any cancer known to man. The young generation is depressed and has very little ambition. The corruption has taken proportions unheard of, even by the low Iranian standards in such matters. In the eyes of the international observers, the Islamic Republic of Iran is notorious for its harsh punishments and its bigotry. Up to this point in 2014, the number of death sentences carried out nears a thousand; many are persecuted and jailed for their enthusiasm in supporting football, volleyball, or listening to Western music. In October, the scandal of acid-attacks on women was to be hastily stifled by accusing the BBC, the MI5/MI6 – and any other foreign spies and agents one could think of – of being the criminals behind the attacks. In Iran today, imbecility is so common that no one is troubled. Therefore on the fourth of November, Iranian clerics had to put on a show, and impress the world with their power. A grand public display of religious faith together with rekindling the memories of the hostage taking of 1979 seemed a golden occasion. However they forgot three basic factors that turned a fanciful firework display into a damp squib. First: the Iranians are weary of such displays. The Islamic rhetoric sickens them. At last, they have realised that the nuclear facilities are by far a more complex issue than the oversimplified notion of uranium enrichment being a heaven-sent remedy to the agricultural [sic], political and social ills. What matters to them is the safety of their family, a badly needed job and a decent life. None of which can be expected in the short term. Second: the world has moved on. Today, the events of 1979 are a piece of history to all except some 79 million Iranians affected by the aggressiveness of a theocratic gang. The ayatollahs’ unyielding and dogmatic views repulse the public outside Iran, and their belief in their own importance is seen as megalomanic. Third: the Islamic Revolution of Iran was thirty-five years ago, long enough to build or destroy a nation. The clerics opted to ruin a nation by their arrogance, sow hatred in fertile lands, and lavishly spend money to structure and arm groups that would herald and implement their ideology. They scarified Iranians to gain prestige among “Omat-e Eslam”, i.e. all Muslims. Today, despite ayatollah claims of justice for all, and peace upon everyone, be it Muslim or non-Muslim, the situation in the Middle East has gone from bad to worse. A full-scale war with its trail of savagery and tragedies is on. This war is patricide, parricide, matricide and fratricide. It calls on the basic bestialities in humans, not on civilised manners. The ayatollahs blame the USA and Israel for it; they too cover up their own evil deeds and fuel the conflicts by their proxies. As expected from a manipulative and dictatorial regime, the Iranian media, mouthpiece of the ayatollahs, were to give the day’s events full coverage. They did their best and wasted more paper, more TV and radio broadcast time and internet resources to hoot the horns. We would have not been bothered about it, if it was not for the mechanism of the propaganda itself, which revived memories among those who were twenty in 1979. In 2014, the marches with printed placards and the chants of the overused slogans were pathetic replays and reeked of hypocrisy. Tens of thousands of pictures of “the day’s glorious rallies” were released on the Iranian news sites. The articles written by the press were a testimony to the cultural level of today’s average Iranian: appalling grammar and misused vocabulary, and recurring clichés. Nothing analytical, just a torrent of cheap propaganda that Iranians take for “News” and it does not bother them in the least anymore. For a nation that boasts the highest level of educated people in the Middle East, having news outlets of such poor quality is a humiliation and once more evidence of hollow declaration. The collective and individual behaviours are numbed by oversimplification in all matters. Simplification throttles the curiosity and the readiness to grasp the issues in their complexity. “Farsi Shakar ast – Farsi is sugar” comes from a poem by Amir Khusrow (fourteenth century). On the fourth of November, Farsi was sour. It was the language of hatred, arrogance and violence. Death to / down with the USA, Israel, Great-Britain. Conquering the spies’ nest [US Embassy Hostage taking] showed our unrelenting quest for justice. “The Glory of the Shiites” [implying all other Muslims are corrupt]. The pathetic world fears our Ashura’s teaching. We have to destroy the enemies within the country and outside it. The Enemies’ quarrel [Setiz] with us will destroy them. The Westerners are arrogant and supercilious [Mostakber Khabis]; their malign and fiendish manners [Estekbar] are known to all. Shortly, the Divine grace will bring us the joy of the Western humiliation. 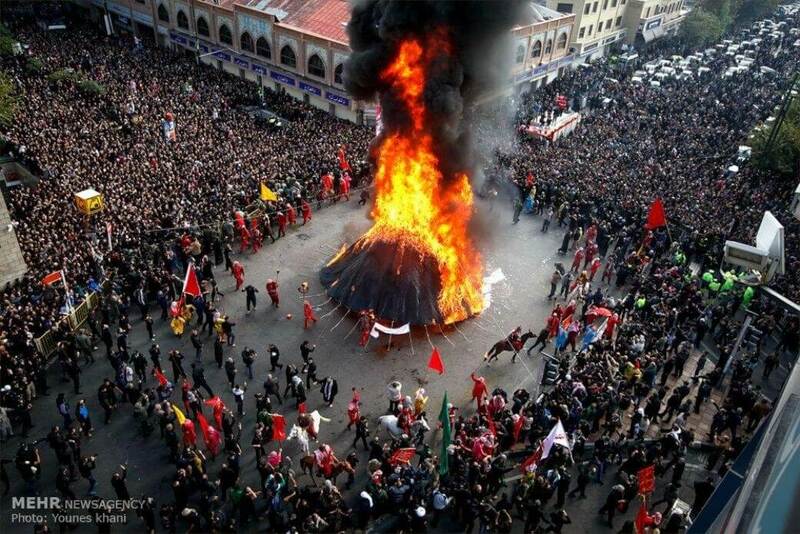 In Ashura, the ritual of burning the US, Israel and Great Britain flags (hardly ever the French flag – why?) was dutifully observed; and Barack Obama was satirised as Shemr (the symbol of cruelty for the Shiites) in derisive mob gatherings. The Shiite dogmas were repeated endlessly, “Enjoining good and forbidding wrong (Amre be ma’arouf- Nahi az Monker)” was the day’s favourite. For the ayatollahs, applying it will solve many social problems and must be used with Islamic compassion (Del-souzi). Certainly, the women victims of the recent acid-attacks had to thank the Islamic compassion when attacked for their “indecent” outfits. The message of the ayatollahs in Ashura was: as a nation, we have to speak up with courage in times of slavery [hear: salve to the West] and never give in to the enemy [hear: the West and those we despise]. We have to keep to our principles and never let ourselves be defeated in abject conditions. In other words, Ashura is a symbol to combat pitiless despots, and arrogant tyrants. Teachings of Ashura are the resurgence of the manly mettle. [sic] [mardane-gui va ta’assob]. In 2014, a gang of certified despots is ruling our country. Whatever the spiritual and symbolic teachings of Ashura, it has been wasted on us. It does not stir up our manly mettle. We have no courage to stand up to the ayatollahs’ despotism. We give in to dictators and are enslaved in abject conditions. We falter, we accuse and denounce each other, and have no pity for those who claim their rights as human. The Shiite hierarchy spared no effort in pounding the drums of Ashura. From the Leader to the lowest ranking, all were mobilised for the day, preaching everywhere. The most virulent preachers, whose ideology and vocabulary is too similar to those of Daesh, were given the headlines in “Breaking News”. Usually the Iranian media, with their “news” fabricated in Tehran, ignore the provinces. However, on Ashura, they had reports of “outstanding, magnificent rallies” from the most remote and backward corners of the provinces. They were especially too eager to report in detail the passion of the crowds for the cause of Hussein and the Velayat-e Faghih, in towns and counties where the authority of the ayatollahs is challenged and the greatest effort of the press is to cover up the clashes between the Pasdaran and citizens. In the West, Kurdistan, Kermanshah, Ilam, Khuzestan, the provinces bordering Iraq, were meticulously reported with words to the glory of the Islamic Revolution. In the south-east, Khorasan-e Djonoubi and Sistan va Baluchistan, provinces bordering Afghanistan and Pakistan, were given particular attention and the figureheads of those counties in the ayatollahs’ pay were duly interviewed. After the tragedy of acid-attacks, Isfahan had nothing better to do but to weep for a bygone martyr. No one mentioned the aftermath of such barbarism: the women fearing for their lives in public places. According to the Iranian media, the world joined the ayatollahs and mourned Hussein. Ashura rallies were held in London, and in mosques, Takiehs and Hussein-ieh [Shiite prayer centres) by lovers of Hussein all over Britain, dazed the Britons [sic]. Anyway, just point to any town you fancied on a world map and the Iranian news outlet had a report for the love and the Glory of Hussein, even in Italy though Vatican City was spared, and, curiously, Paris too. Hundreds of thousands of pictures taken on Ashura belonged to a male chauvinist Islamic society in which women are merely tolerated, and used as an alibi when necessary. A society that has institutionalised systematic brainwashing from the cradle. We may find a moment of relief in thinking that all is not lost: perhaps people were paid to participate in the marches; after all the Iranians are known to expect payment for their social/political acts. Perhaps some needed to be seen in the marches to keep their jobs and their social privileges. Perhaps some just showed up to see if his neighbour was there too. Perhaps some just joined the crowd because they needed a change from a dull routine, seeking excitement. However, the search for such excuses is unsympathetic for any freedom lover and the conclusion drawn unpleasant: the majority of the people need a leader to tell them what to do and which hand to kiss. Even if, in Iran, there are people that surpass themselves and dare to challenge the conventionalities and the ridiculous prohibitions, it is a marginal phenomenon and not to be credited to common behaviour. The news we get about Iran in the Western media is from the tiny patch of the North of Tehran. Our views on Iran are shaped by Tehran’s glitter, if consumerism can be called so. Forget about the beautiful women of the North of Tehran, made up and sculpted by surgery. Forget about the wishy-washy discourses of your dandy friends driving you from one lavish party to the next. They are pleasant to see and to hear but they have no power in pushing for social and political reforms. Certainly, some of them at least took a “hygienic” part in these rallies, just to be seen and later be left in peace from potential critics. We Iranians have wasted our time and our dignity since 1979. Following obediently the path of the ayatollahs, we celebrate the folly of death. The ayatollahs preach that Muhammad forbade us from worshipping idols. We Iranian Shiites have Hussein to worship as an idol, as a totem. Today Ashura is a duff spectacle, a cacophony. We have forgotten the message: to seek freedom, to stand up against tyranny and to protect the rights of the weakest among us. In here we republish the pictures taken from Iranian news websites. Will these pictures one day be replaced by the joyful pictures of people at peace with themselves and the world? Watching these pictures is dreary, but they tell a story: the story of a short-sighted nation unable to build a future for its children. The bottom line is that we cannot progress and build our country, if we Iranians are busy criticising everyone else’s faults, but not our own. Refer to: Chronicles from Iran, ebook, 2012, Ashura.